Are you a regular at spin classes in your local gym? Do you love the thrill of this heart-pounding, super-sweaty sport? Do you find yourself wishing you could choose the music and the moves as you’re pedaling away? If this sounds like you, then you may want to become a certified spin instructor. Other important skills you may acquire as you’re learning how to become a spin instructor include: building a play list, motivational techniques, and working with particular populations like the elderly. When it comes to choosing a spin certification program, there isn’t really any one go-to certification program. The one that bills itself as the leader in this realm – with more than 250,000 graduates to-date – is the aptly named Spinning®. The company offers a range of options starting with live, 1-2 day courses that cover both practice and theory, through to continuing education and recertification programs available online. Some gyms may even offer their own courses, to groom instructors in their own style. For example, SoulCycle, which operates more than 80 studios across the US and Canada, has its own grueling 10-week training program, with a very selective audition process. When exploring which spinning instructor course works for you, one parameter you may consider is the online vs. offline options. Generally speaking, if possible, it’s always a plus to take an offline course, where you can get hands-on training from a pro. That being said, there are plenty of options for getting spinning certification online. For example, Cycling Fusion offers the opportunity to learn to be a spinning teacher entirely online, with video courses plus a manual. You can then submit a video of yourself for your final exam. Similarly, American Fitness Professionals & Associates offers self-paced spin instructor certification online, that’s nationally recognized. To become a certified spinning instructor mostly takes determination and a certain level of physical fitness. In other words, there are no real prerequisites. By way of experience, many spin teachers come from either a general fitness background – having taught aerobics, step class or TRX before. But many others are simply spin class lovers looking for either a new career path, or to do some teaching on the side. In general, if you’re interested in pursuing spin certification, you should stay fit, buy proper spin shoes, and invest in a good workout wardrobe. Other characteristics that help include an upbeat personality, sense of rhythm and pacing, love of people, and the ability to command a room. Teaching spinning classes requires endurance. You want to be as fit as possible to meet the challenge. As such, in addition to spinning, you should be doing cross training and other forms of endurance exercise. In particular, you’ll want to add building upper-body strength into your fitness routine, as spinning mostly works your legs. As a spinning teacher, you’ll eventually develop your own style. To help you prepare, go to as many classes as you can with different teachers in different studios and gyms. You will learn a lot this way, including things you like about their class, as well as techniques you’d like to avoid. What’s Next After You’ve Become a Certified Spin Instructor? Remember that getting certification is only the beginning. On your journey to become a spin instructor you’ll need to do a number of things in order to build your spin teacher credentials, and fill your schedule with classes. So what do you need to consider? 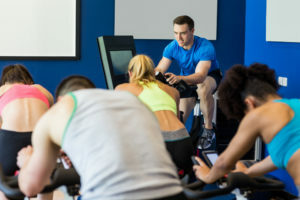 First and foremost, once you’ve become a certified spin instructor, you’ll likely need spinning instructor insurance to find work. In fact, many gyms and studios will require a certificate of insurance as a starting point. After that, there’s going to be a fair bit of door-knocking involved. If you trained to become an instructor at a certain cycling studio, then that’s a good place to start looking for a position. If that’s not the case, but you’re a regular spinner at a different gym, try looking for a job there. In all likelihood, you may find that it takes you time to get classes and build your customer base. In the meantime, you may need to teach during less desirable time slots like very early mornings. You should also be open to subbing for absent teachers (often with little warning). Once you’ve proven yourself, and built a loyal following, landing classes should get easier over time. That being said, you’ll still need to keep an eye on your future for long-term success, now that you’ve become a certified spin instructor. Help make your spinning career a smoother ride by keeping up with music and fitness trends, and taking upgrade and refresher courses accordingly. Happy Hug a Plumber Day!